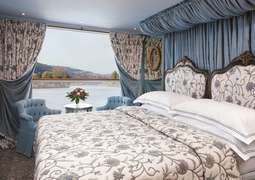 Antoinette has been billed as one of the most luxurious river cruise ships the world has ever seen. With it's 18th century French character, you will feel as though you have stepped back into one of the grandest eras of time. 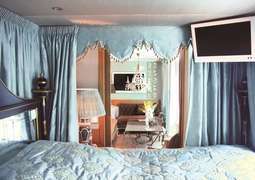 Aboard the S.S. Antoinette there is sufficient space for 164 passengers in nine suites (including the majestic Royal Suite) and 71 outside cabins, which have been split into categories depending on the deck they are on. The Cabins combine high-quality furniture and comfortable equipment. The special thing about these cabins is their truly unique style from a bygone era. In addition, all cabins and cabin hold a specific handmade Savoir ® bed and a private bathroom. In the suites, there are also additional services. Meals are enjoyed with fellow passengers in the Versailles restaurant aboard. Breakfast and lunch will be offered with a buffet, while in the evening national and international delicacies will be served. In addition to the main restaurant, there are several lounges, where no wishes remain unfulfilled. Offering cocktails and fine wines. In addition there is a tea and coffee bar available round-the-clock. Thanks to various entertainment options on board your stay on board the S.S. Antoinette will never be boring. Enjoy sporty activities in the gym and relax in the sauna afterwards. If you are looking for something more relaxed, you can sit poolside or enjoy a relaxing session at the on board spa. The ship also features an onboard cinema and a dance floor at the Salon du Grand Trianon. On regular evenings there is a varied entertainment program.